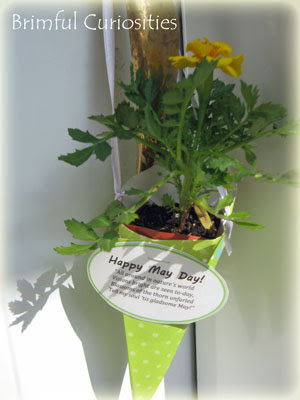 My kids spread some spring cheer yesterday by hanging May Baskets on our neighbor's doors. We made 12 baskets total and placed a marigold plant inside each one. We usually use cut flowers from around the yard but this year, due to the early spring, all of our spring flowers are already finished blooming! It only takes 3 pieces of 12" x 12" scrapbook paper to make 12 holders. Cut each piece of scrapbook paper into four - 6 inch square sections. 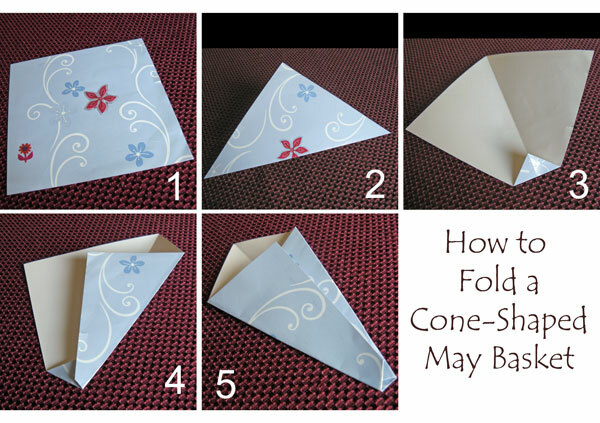 Fold the squares into cones using the guide below. 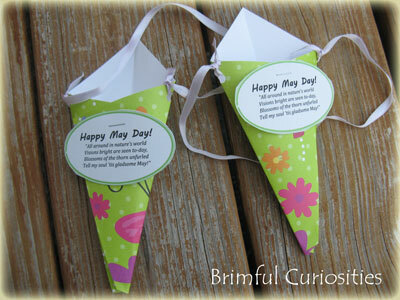 Staple the cone flaps together, punch holes on the sides and add a piece of ribbon for a handle. Tell my soul 'tis gladsome May!" I hope to remember to do that next year! What a great random act of kindness. Thanks for sharing it! What a neat idea...I bet the recipiants loved it!! These are great. They could work well for Mother's Day gifts too! How sweet! We got our first May basket from a neighbor girl and it made our day!